Limited Easter Packages Available. Only 4 Left! Want a $100 discount code right now? *Conditions Apply. Min spend $749. See terms & conditions. Let your chooks out and collect eggs in the morning as effortlessly as the sun rises. Your Taj Mahal chicken coop is designed to bring joy to you and your chickens every day, from the safest, most durable and trusted brand. Convenience & comfort for your chickens: the Taj Mahal™ features 2 large nesting boxes that comfortably fit 3 hens each. And with the external nesting box lid, the joy of collecting eggs is now convenient, too. Designed to make chickens happy & comfy: the perches are perfectly designed and shaped to suit your hens’ feet with custom built 50mm perches and 3m of wing room for roosting and resting. • We only use A-grade timber, kiln dried slowly over months to ensure it lasts and can withstand the harsh Australian climate. • Feel it for yourself. Our coops weigh up to three times that of any others on the market. This strength and durability allows us to comfortably offer a full 12 month warranty. • Colour: arrives natural, ready for paining which provides a superior longer lasting finish. It's part of the fun, particularly if you get the whole family involved! 10mm x 10mm galvanised wire mesh & sliding bolt locks on doors keep your chooks safe from snakes and other vermin. Want extra security? Add our Wire Mesh Flooring, Auto Door Opener, or a Motion Sensor Light. • Good ventilation is essential for happy, productive hens. 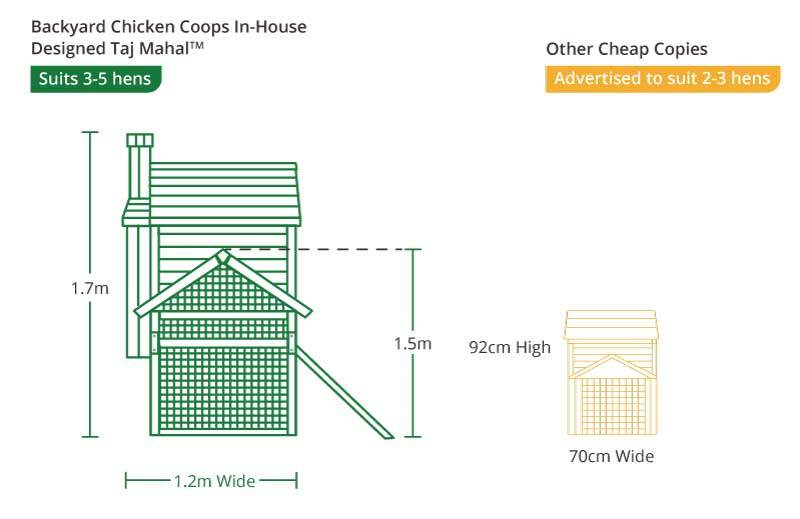 The Taj Mahal™ Chicken Coop ensures an airy, draught-free environment for all seasons. • Chooks benefits from sliding windows, high ceilings and a capped off chimney. • Safe from the elements. The tongue & groove timber style cladding makes a magnificent water barrier. • Oversized, so the rain falls off and away from the chicken coop, keeping it dry and comfy for your chooks. Slide out cleaning tray slides with a removable 30mm deep steel tray insert allowing for easy cleaning with zero fuss. • We have included galvanised wheels for strength and durability. • Moving the coop is as easy as using a wheelbarrow. • Everything is included and clearly labelled. • All components are galvanised for longevity and durability. • No hidden stress. All the holes have been pre-drilled, plus the locks, hinges, latches, wire mesh and doors are all complete. All you need is a power drill with a Phillips head bit and an extra pair of helping hands. Plus: We’ve got your back! A priority assembly support is available to all customers by our in-house customer service team. Coop assembly, chicken sourcing, and painting services are available at the click of a button. If this sounds like something you would prefer us to organise for you, simply let us know! Assembly pricing from just $249*. Download the product brochure to find out all you need to know about this fabulous coop. Full of detailed information, customer coops, painting tips & so much more! How strong is it? How long will it last? At 88kg, more than double the weight of the average coop on the market, the strength, weight and durability allows us to comfortably offer a 2 year warranty. Our coops have made it through some of the toughest of Australia’s traitorous weather. How many chickens will it fit? With just over 2.76 square metres of luxury, it is suitable for 3 full time or 5 hens that free-ranging as there is ample perching space for them at night (they like to snuggle together). Is it easy to move? Absolutely! If you are not setting up a foundation, then you simply tilt it up like a wheelbarrow and use the wheels to move it around. Is it safe? Snake proof etc? Absolutely, we only use a 10mm x 10mm, 3mm thick galvanised wire mesh to ensure no one else other than your chickens can call the coop home! You order will be picked, packed and ready for dispatch within 24 hours of placing your order (if all goods in stock). You will receive an email with tracking once it has left us and will arrive within 5-14 working days. If you need it sooner, we can organise express services, please call once you have placed your order. We've got your back! We are proud of our products and offer a full one year warranty. If you lose or damage a panel or something gets damaged in transit and requires replacement we are here to assist you 7 days a week! While assembly is quite simple - we provide full colour instructions, follow-along video and 7 day assistance - if you are short of time and would prefer someone to do it for you, we'll organise the assembly of your Taj Mahal Chicken Coop from $249*. 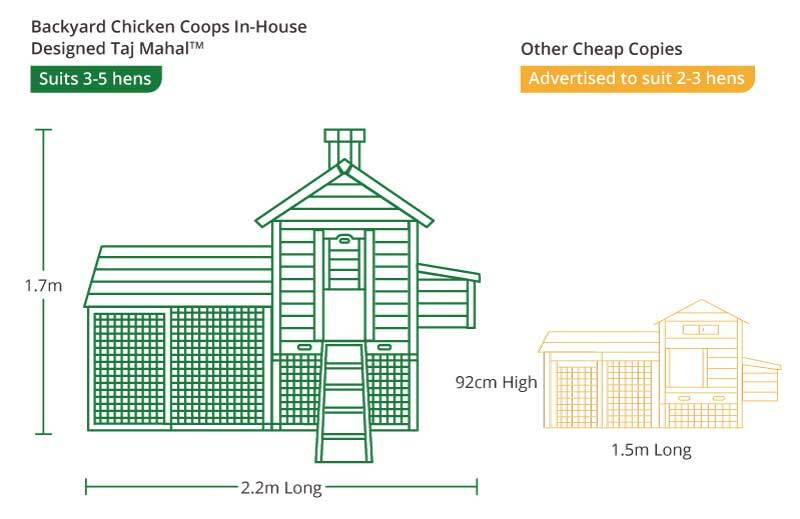 Take home the Taj Mahal Chicken Coop today from just $20 a month with ZipPay, or 6 x easy payments of $99* with OpenPay. In addition to this we of course also accept PayPal, and Debit & Credit cards at the online checkout, or over the phone.